Occasionally I run across some golden zucchini at the Saturday markets. I have written about the vegetable before, here, but I don’t think I have done a post about the simple way we like to prepare this vegetable at home. Simply wash and slice the vegetable into 1/3 inch thick disks (discard the stem). Heat up a pan and add some olive oil and a large pat of butter. 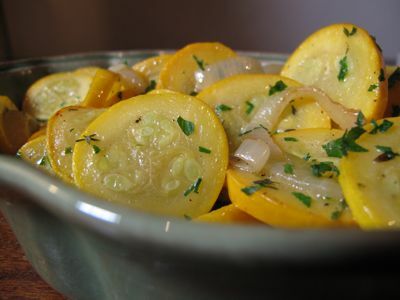 Saute some sliced onions until translucent, add the sliced zucchini and toss and mix over medium heat until just done. You will know the zucchini is done when some of the centers are softe and the color of the raw vegetable starts to get a bit translucent. Don’t overcook the zucchini as it will get mushy. Season with some salt and pepper and add some chopped Italian parsley as a garnish just before taking it off the fire. Serve hot. 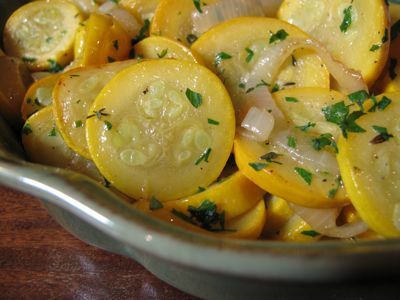 An excellent side dish to fried and grilled foods. Very, very easy to do, and relatively healthy, too. Hey thanks, MM! I have always wondered how to cook this veg. I bet that flat leaf parsley adds a bit of lightness to the oil. Do you think you can do this with the more common green ones? I think this is just wonderful :) Out of curiosity, what are your traffic statistics now? Not that I want to distract you from your indefatigable quest for the holy grail of leche flan. But here’s something you might want to try next: champorado using pinipig instead of rice, plus pandan and cinnamon to kick it up a notch. MM, about 3 years ago, there was a new variety of yellow zucchini called Papaya Pear, an AAS winner. I planted it and it lived up to its award…not as seedy as theregular ones, has more body or structure, and unbelievable yield. …best part, it doesn’t grow to those humongous ones that people leave on your doorstep! But if you are the LUCKY recipient of those kind of zucchini, make them into ZUCCHINI RELISH….just like those hamburger relish. I have a knock out recipe (if I find it in my Tupperware, I will post it if anyone wants to try it. Gina: are you referring to the Kapampangan delicacy called Duman? …If that is what you are thinking about, yes, hands down, Duman is it!!! ….and I am sure alooooot of Kapampangans will agree with me, right Maria Clara? Hi bettyq. I am not familiar with this delicacy ‘duman.’ In the URL I gave above, the food writer calls it his secret recipe for a truly special champorado. AWESOME!!! Some of the best dishes are the simple ones. This is also one of my favorite side dishes. Never tried the golden zucchini but am a fan of the regular green ones. I always have it grilled and eaten with salads, in sandwiches. I sauteed it once and didn’t like it because I felt it had a slightly bitter aftertaste which it never had grilled/roasted. Is it just me, or does it really do that? Duman! Yum!!!! My family is Kapampangan, and when it’s in season, we just have to have it. We like to add it to hot chocolate beverage. We never tried it as champorado, but now that I think about it, when it’s added to hot thick chocolate, it is like champorado! zena i also find that it has a bitter taste while people am with just enjoy eating it. maybe it is just the two of us . hmmm. sliced thinly, i toss the (common green)zuchinni with the salad greens; cubed, i add it in the kebabs; diced, i put it as vegetable fillers in omelet or torta; shredded, it is mixed in batter to make zuchinni bread (subbing carrots with zuchinni in carrot bread). it’s one of those versatile vegetables. and now i discovered it can be made into a relish… ah, so many things you can learn just by reading the blogs and the posts. thanks a lot! How nice to visit this site. You will be welcome by foods. Gina, I can’t eat champorado made with rice….. it’s got to be pinipig! Gina…every time my sister goes back home, my nephew-in-law has Duman (frozen) all ready for us here. But waaaaay better if you put it in hot chocolate made with ganache. Try it Gigi! Really mas masarap…You can make it as thick or as thin as you want it. But to make with pandan, steep the cinnnamon stick and the pandan in the milk first before you add the ganache and the duman. Before serving….whip (soft peaks only!) some heavy cream and add a dollop on top and shaved chocolate! Bettyq: The real Duman is one of Pampanga’s pride and joy! It is one of her highly marketable commodities. Bettyq: The Kapampangan make their chocolate batirol with roasted ground peanuts. The more peanuts you mix with your cocoa beans the frothier it is. I believe the ratio is 3 cups of roasted peanuts to 1 cup of roasted cocoa beans. They roast them separate comes grinding time they mixed them together and carabao milk is always their unanimous choice to make tsokolateng batirol. The doyennes mix one part cashew nuts to one part peanuts. Personally, I do not like the one with cashew nuts. Thanks in advance for sharing your zucchini relish recipe. It is great with hot dogs. Gina: Duman and pinipig are completely different. Pinipig is toasted before added in halo halo which I believe is the universal use of pinipig and very affordable. You nibble pinipig uncooked you ended up with a dentistâ€™s bill. Duman is usually light green in color, soft and delicate and kind of pricey because of the work involved. They have to harvest the rice kernel – the sweet rice variety – lakatang just about they reach their maturity. So the handling and care from the rice field to processing area to separate the rice from the husk is laborious. They soak the rice kernel in big banga and simmer it. Then they dry the boiled kernels out in the sun. Once is sun dried they roast it under low fire. Once roasted or toasted they pound the duman with that big wooden mortal and pestle and willow the husk and what is left is duman. Duman is always kept in matured banana leaves. It is very good eaten as is, in tsokolateng batirol, making suman and kalamay. From what I was told the real duman does not make it to the market. It is signed off to buyers even before harvest time. So the makers of Duman have an established generation of sukis. People who like duman keep very good buyer relationship with the duman makers. When Duman is done the makers drop it off at the buyerâ€™s house and will be followed with lots of tsismis and kumustahan like catching up with everyday life. Freezing the duman will prolong its life and goodness. Beware there are so many corrupted duman out in the market which is soft but will irritate your throat. I was told they use the bamboo leaves to obtain that green color of corrupted duman. Gina…try to befriend a Kapampangan there. Then come November, ask him/her to share her Duman with you. It is young rice harvested while it is still green and pounded. …the BEST EVER!!!! Yes, it is pinipig in its baby form….haven’t reached adulthood yet! Thanks, MC! I am going to add CHOC NUT to my hot chocolate…maybe that will work here! Hey, MC…my nephew-in-laws mom is from Sta. Rita. Knowing it is in short supply, she buys them like there is no tom. and freezes them in packages for us so we can enjoy it here ALL YEAR ROUND!!!! Bettyq: Sta. Rita is the only place I know they make duman. Lucky you for having a well hooked up duman supplier. There is big demand but not a lot of supply due I believe the agricultural lands were converted to freeways, subdivisions and livestock farming. Plus it is highly seasonal only available before the Misa de Gallo and ends one week after New Year. Zucchini bread is excellent. One of my comfort foods is a bowl of soup and zucchini bread. Sorry, I have not made zucchini bread in my life just get them from my nearby bakery. They also have zucchini muffin which I believe is the smaller version of the loaf bread. Maria Clara: many, many thanks for this very comprehensive and fascinating description of the duman-making process! Like many of our culinary traditions, it’s equal parts labor of love, business enterprise, and community bonding exercise. It conjures up images of an Amorsolo painting. Bettyq, now that I know what it is (green baby pinipig! ), I will certainly be on the lookout for it. I’ve never been partial to zuchinni…but now that you’ve shown this…hmmmm…will try this when I get some….thanks MM…. Zucchinis are one of my favourite vegie as it’s so easily prepared or cooked eg.grilled,sauteed,bbqued,baked,crumbed,with pancakes,bread,patties,muffins,pickled,tempura,stuffed with meats etc….It’s so versatile and has got a subtle taste and I just love em! Hi Bettyq,would really love the recipe for your zucchini relish,thank you very much! hi Linda! Not only is zucchini easily prepared, it EASILY grows too! Some people are so tempted to plant zucchinis like 4 plants, then when they start bearing fruit, it just literally comes out of your ears….the more you pick, the more they come! Kaya, two plants is enough for me, one green and one yellow. Here is the relish recipe that I use when I zucchini just grows like a giant upo! Yield is about 8 pints. 2 large green peppers, chopped. Let this smixture sit overnight …Then drain the next day. Stir to dissolve sugar. Then heat to boiling. Do not stir while boiling. Then addd the drained vegeetables to the vinegar mixture once it has boiled. Bring back the whole pot to a boil. Then…do this: if you are not going to process this in jars,, cook the mixture for at least 20 more minutes., cool it down and pack in zip plck and FREEZE. But if you want to process them, sterilize 8 pint size jars, pour relish , seal and process. If you are going to p[rocess this, just bring the vegetable mixture to a boiil, and pack into jars and seal and process. Excellent to use on hot dogs, hamburgers, as a substitute for cucumber sweet relish. Tatlo na tayo. The zucchini I sauteed once also had a bitter after taste. Hindi na ako umulit after that bad experience. Just wondering, did we buy the wrong variety? Sonny sj, Zena and John Paul: the slightly bitter taste you guys had could be due to fluctuations in temp. while the zuccchini was growing…also, fluctuations in moisture or watering. Zucchini is also what we call a heavy feeder…requires a lot of soil nutrients to be healthy. If the soil lacks in certain nutrients, it could also result in slight bitterness. But then, you won’t kknow if the zucchini was grown under the right conditions, would you? On the other end of the spectrum….if the mother seed is the result of cross pollination with other cucurbit (squash family) that has bitter compounds, then it has that gene. BUT this zucchini is inedible! It is really bitter and can cause distress..nausea! Betty q., methinks i shall interview my zucchinis next time if i plan to sautee them. =) Very interesting, your explanation. Yup, I agree totally with you, Zena! It is best to know their genealogy!!!….hahahahahahaa….. If the mom had a fling!!!! This is what Silly Lolo would say!!!! Bettyq: The picking salt you use in your relish is that Morton pickling salt or your mix your own pickling salt? Thanks. MC…I guess it is Morton’s in US. and what we have here is Sifto coarse salt…it says: “natural, no additives” on the box. My mom who is kindda picky on “american” veggies surprised us when she said she loved eating sliced raw succhinni dipped in ranch style dressing. And so when planting season came, I bought a packet seed of this veggie for mom’s sake. On my next box to be sent to the Pinas, I am enclosing some seeds to be planted in Quezon Province. I hope tumubo. or how about BUTTERNUT squash seeds….there is a variety called REALLY BIG BUTTERNUT. Hindi kita binibiro. Iyon talaga ang pangalan ng squash….napakalaki ng mga bunga! This was written but posted quite late; was not able to send it because somehow, err, work got in the way. MM later noted his post on Duman by The Pilgrim’s Pots & Pans. Re, Duman, Karen of The Pilgrim’s Pots & Pans has a very comprehensive post on this special delicacy, from planting, harvesting, prep. and to the table. We ate this precious, delicious grain when we were growing up, with tidbits of how special it is from our parents; but the post vividly and comprehensively described it best, summarized by Maria Clara above. bettyq: I sure will search for this seeds. thanks for the info. maria clara is likely correct in that duman is made only in pampanga. there is a similar delicacy known as “ubas” in aklan. the preparation is the same, except that the grains are not soaked and simmered in water and dried under the sun. also ordinary rice variety may be used, not only malagkit.